Ferryhill is situated just off the A167 between Durham and Darlington. The Methodist Church is almost ‘back to back’ with the Town Hall at the end of the Market Place. 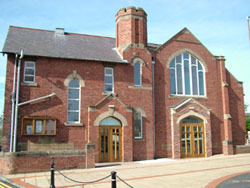 The present church, now the only remaining Methodist Church in Ferryhill, was opened in 1910 and refurbished in 2006, with chairs downstairs to make it more comfortable and multi functional.We try to make everyone feel welcome as well as offering outreach to the local community. Mondays, 2.15pm: Women’s Own Meets weekly. We are a group of friendly women who enjoy time together to catch up with the news, have a laugh and listen to a variety of speakers. The meeting lasts about an hour with tea & biscuits at the close. We are always pleased to welcome visitors and new members to our meeting. We occasionally have meals out, when we invite other members of the church family to join us. Mondays, 7.00pm: Women’s Circle: Second Monday of the month, Sep-June. A group of friendly women from the church and wider community who meet to enjoy a varied programme of talks, demonstrations and craft evenings and occasional meals out together. All women are most welcome to come along to any of our meetings even if they cannot commit themselves to attend regularly. Each Tuesday: 10.00am: Acorn Group. A friendly, informal discussion group. Friday, 9.30 – 12 noon: Coffee Morning. A popular meeting place for people, from the community as well as the church, to chat over a cup of tea/coffee, to catch up on all the news, to look for bargains on the Bric a Brac stall and among the ‘Ferryhill Fashions’ . We support a different charity each month. There is also a monthly cake stall & raffle. As a church family we also support a number of charities and appeals throughout the year. We hold a variety of social events throughout the year eg. Beetle Drives, Table Top Sales, Sponsored Walks, Strawberry Teas & Autumn Fair. Everyone is guaranteed a warm welcome at any of these events. Our Children & Young People’s Workers visit the local Primary Schools to lead Assemblies and the children come to the church to experience the Christmas and Easter Journeys. The four local Primary Schools all come together at our church, usually in May, to take part in the Children’s ‘Big Sing’ to raise money for Christian Aid. At Christmas children from Enter CIC, a performing arts organisation, based in Ferryhill, sing and perform at our Family Carol Service. We hold services in Tenlands Care Centre in Ferryhill. We are currently changing from the 4th Monday of the month to the 3rd Wednesday of the month. Alternative months are Communion Services. Each year we hold an ‘In Thanksgiving & Remembrance’ Service for loved ones who have died. This service is usually held on the first Sunday in November, and this year will be held on 5th of November at 2.30pm. Anyone is welcome to come to this service. We are part of; Ferryhill Churches Together and share in events with the other churches.